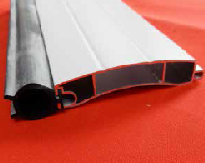 The base rail has a rubber strip on the bottom edge to aid thermal and acoustic insulation as well as protection against pests and ingress of water. The Optima 77 SE comes with internal manual override, two remote handsets and wireless safety edge. The safety edge transmitter detects obstructions and stops the motor. The internal receiver unit also comes with one touch control buttons as on the wireless handsets. The Optima 77 DM comes with internal manual override, two remote ‘one push to open’ and ‘hold to close’ handsets and an internal receiver also with operation buttons. The curtain is made of insulating, foam filled, formed aluminium slats, 77 x 18mm. These interlinked run in double side brush guide runners. Easy control from the comfort of your car. 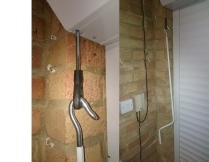 Two remote handsets are supplied with each roller door. Internal manual override is by a simple winding handle. 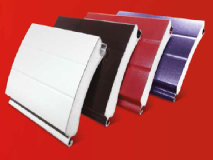 The Optima 77 provides increased insulation and a stronger physical barrier than the Compact 55. The Maximum width and height for the Optima 77 curtain is 4.88m Wide x 2.3m High. The cross sectional dimensions of the slats are 77 x 18mm. 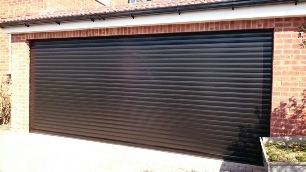 The Optima 77 range is available with External Manual Override for garages with no alternative access.